What is it? A beer by faux craft brewery “Boundary Road Brewery”, an imprint of Independent Liquor – one of the largest alcoholic beverage makers in New Zealand – which is itself owned by Japanese company Asahi. 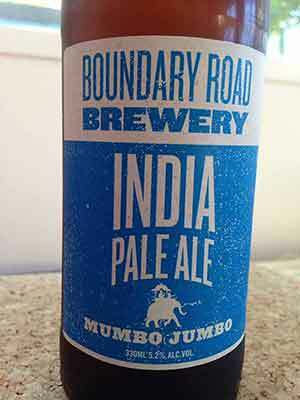 Bottle: A vintage-looking blue beer label features the name of the beer – Mumbo Jumbo India Pale Ale by Boundary Road Brewery, in case you missed the title of this review – and a small image of people riding an elephant. The elephant iconography calls to mind Colonial India – specifically the British Raj during the 19th century. Unsurprisingly, the blurb on the bottle confirms our suspicions. Blurb on the bottle: Back in the British Raj, elephant riding, tea-swilling settlers were in dire need of rescuing from the Indian sun. And so the India Pale Ale was born. Brewed with extra hops so it’d survive the voyage east, it was imbued with floral aromas, malty sweetness and a lingering dry finish. But enough of that Mumbo Jumbo. Stretch out on the verandah and enjoy. Tastes like: A cheap but cheerful IPA. Is that treacle I taste, hidden somewhere in this amber-copper IPA? And caramel? To be honest, this might be one of the blander IPAs I’ve attempted to review in recent times. Writing about what it tastes like is proving difficult, which is why I’m padding it out by saying how difficult it is to write about, which it is. Is it the best beer ever? It boasts moderate bitterness and moderate hoppy aromas, making it a fairly moderate IPA all round. It has a sort of thick, soapy flavour which isn’t exactly unpleasant, but isn’t amazing either. For the budget-conscious beer drinker who wants to try something different instead of the usual mass-produced lagers, this isn’t a bad choice. But there are better beers out there in this price range (roughly $12-$13 NZ for a six-pack), and this isn’t Boundary Road’s best beer by some distance. What else should I drink? Unlike Boundary Road Brewery, Founders Brewery in Nelson at least was a proper craft brewery before it was bought out by Independent Liquor and the Asahi Group. Now it produces fairly decent beers that are in the same price range as Mumbo Jumbo. Give Founders 2009 IPA a try – we reckon it’s a bit better than this beer – or Boundary Road Brewery’s Bouncing Czech pilsener is very decent.